This simple but effective natural rubber record clamp fits most unthreaded platter spindles. 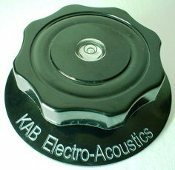 The KAB Super Record Grip is effective at damping resonances and improving bass response and imaging focus. The inset level is helpful in ensuring that your turntable is perfectly level so that it can operate properly. More infomation on this product can be found on our KAB Product Information web page. Please contact us for information on whether the KAB Record Grip will fit your particular turntable spindle. Caution is advised when using the Super Record Grip with sprung or suspended turntables.